***If you book a party of 6 people, your own fee is 50% off! Maximum of 6 people, first-come, first-serve. Call ahead please. No instruction. Bring a project. Use of facility, dyes and tools. 3 Hour instruction. Design penciled on egg. Student learns to wax over design. Choice of one color. ​Dyed and acid-etched brown chicken egg with some variations. $45 per student, includes all supplies. The pattern on the front egg is the design we'll be exploring. If students have the time, they can explore other variations. This class will allow student to practice waxing lines and using vinegar and the shell color, and one to two colors to create a primitive style design. This design highlights the use of a diagonal or "on the bias" band. ​Acid-etched brown chicken egg and some variations. $45 per student, includes all supplies. The pattern on the front egg is the design we'll be exploring. If students have the time, they can explore other variations. This class will allow student to practice waxing lines and using vinegar and the shell color to create a tone on tone design. One color may be added at the end if time allows. *All classes must be paid in full. Cancellation policy: Non-refundable (as class prep must be done ahead of time). Beginning Class for Lucky Celtic Knotwork. Student learns to wax over design. Two colors. Intermediate Class for Lucky Celtic Knotwork. and marks egg and picks choice of motif. Choice of two colors. Beginning Class for Chocolate Rabbit and Flowers. Student learns to wax over design. Choice of two colors. Intermediate Class for Chocolate Rabbit. ​and marks egg and pick choice of motif. Choice of two colors. Class fee $45 each, includes all materials. Limit 6 per class. Book 6 people to fill class, your class fee is 1/2 off! Beginning Class for Floral and Lace. Student learns to wax over design. Choice of color. Intermediate Class for Floral and Lace. and marks egg and picks motif. Choice of color. Classes: Instructor will travel within a 200 mile radius of Essex Jct., Vermont. 3 hours of instruction. Materials provided. Student is given an egg with markings. Student will learn how to use a traditional and an electric kistska and practice line work and wax flow. Limited number of color choices. 4 hour class. Materials provided. 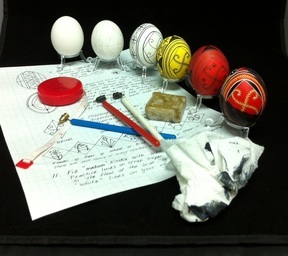 Student will start with a divided egg, but pencil in most of the design. Student will use traditional and electric kitska to wax in design. Student will choose a limited color palette. *Please specify class design or instructor may suggest one. 5 hour class. Materials provided. Student will use lathe, and draw design on goose egg. Student will use traditional and electric kitska. Student will pick one to two colors. Student may not finish the egg in it's entirety, but will have a good start to take home and finish themselves. ​*Please specify design or instructor can suggest one. 3-4-5 hour one-on-one instruction. Student may bring an egg to troubleshoot on, ask questions, take notes, bring a division they'd like to try or can't figure out, egg preparation, dye sequence, special tricks and tips...or as much of all of the above we can fit in the allotted time. Student can draw out the design using an egg of choice (up to a goose) and wax...may not finish an egg, but would put you well on your way to finish at home. Larger eggs to work on with teacher are available, subject to special pricing.